President Donald J. Trump’s recent announcement that he is withdrawing the 2,000 American troops stationed in Syria has sent shockwaves throughout the nation’s capital. A bipartisan consensus has formed that Trump not only erred, but has abandoned America’s erstwhile friends, the Kurds, to be slaughtered by America’s NATO partner, Turkey. This is simply inaccurate. The Kurds do share close ties with the United States. Despite this, however, no American president has ever vindicated the Kurdish dream of an independent sovereign state. Trump is not at all different. Turkey sits atop the largest part of the Kurdish population. Relinquishing the Kurdish-dominated southern part of Turkey would mean kissing nearly two thirds of the Turks’ massive country goodbye. Northern Iraq, northeast Syria, northern Iran, and southwestern Azerbaijan would also suffer massive territorial losses. Many people sympathetic to the Kurdish cause (such as this author, for the record) have often lamented the injustice that such a large ethnic group with a shared culture, history, and language should be subdivided among five countries that are mostly hostile to them. Few of us have taken the time to consider the geopolitical implications of such notions. It would be a moral good to midwife Kurdish independence. But the costs – specifically to American servicemen – would be onerous. Do you believe that Iran, Syria, Turkey, or even Iraq or Azerbaijan would simply shrug as large parts of its country were removed by the United States and handed over to a Kurdish government only just getting itself together? We shouldn’t forget also that Turkey is an actual ally – a NATO partner, no less – whereas there is no Kurdistan. Unfortunately, the time for imposing such a new order in the chaotic Middle East has come and gone. That moment was in 1991, when George H.W. Bush decided to “liberate” autocratic Kuwait from the clutches of the (until that time) nominal American client, the equally autocratic Iraq. When Bush opted to (prematurely) end Desert Storm, leaving Saddam Hussein in power in Iraq, the decision was also made to abandon the Kurds to their fate. Because of this cold decision, the Kurds were slaughtered en masse by Saddam’s forces. Yes, America spent the 1990s providing a no-fly zone in northern Iraq, which allowed for the creation of a quasi-independent Kurdish state there. Yet no American leader ever embraced the concept of an actual independent Kurdish state – especially given the implications for Turkey. Another moment came and went for an American-backed Kurdish state in northern Iraq when George W. Bush toppled Saddam Hussein’s regime. Despite the resounding victory the Bush administration enjoyed in 2003, there was no plan to fundamentally redraw the borders of the region to make it more egalitarian (by recognizing the sovereignty of the various ethno-religious groups that existed in the Mideast). Failure to do that consigned the Kurds to nothing more than a subordinate population in the various countries whose territory they lived in. When President Donald Trump took over the government, he too had the opportunity to honor the Kurds by granting them a state. After all, they had done much fighting on America’s behalf against ISIS. Their commitment to that fight was hardly selfless: they had hoped that standing against ISIS as vociferously as they did would win the hearts and minds of Americans, who would, in turn, support Kurdish independence after the defeat of ISIS in Iraq and Syria. Plus ISIS was disproportionately slaughtering the Kurdish populations of the region – meaning that the Kurds had little choice but to defend themselves. Also, the Kurds are not entirely Americans in waiting. They have a long track record of terrorism and kidnapping. While they are mostly Muslims, they are ideological Marxists. Until recently, the various Kurdish groups supporting Kurdish independence were also listed by the State Department as terrorists for decades. The souring of U.S.-Turkish relations can almost entirely be attributed to America’s support of the Kurds. In the 1990s and early 2000s, the United States enjoyed its position as the unipolar power. Today, however, the world is a multipolar system, in which many great powers vie for dominance. In such a scenario, then, the United States must take a step back from expensive foreign entanglements and engage in diplomacy meant to align itself with other great powers (such as Turkey). I have firm faith that the Kurds will one day get their independence. The day for that is not now. 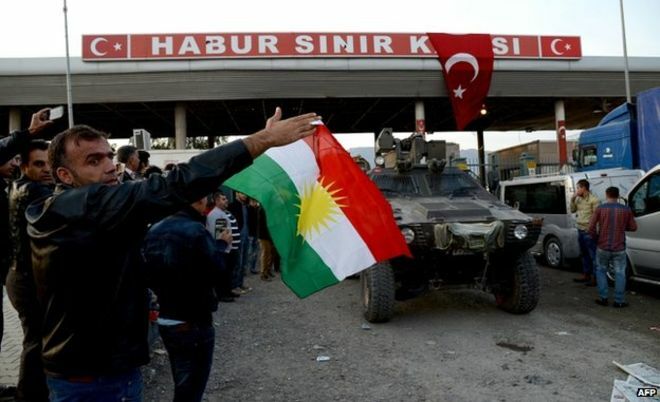 The best solution for the benighted Kurds would be to hunker down in their enclaves and lie in wait until their host nations – particularly those in Syria, Iran, and Turkey – become weak and unable to prevent the call for Kurdish independence. President Trump has made the right decision to acquiesce to the brutal autocrats in Turkey on the matter of the Kurds, if only because the United States needs autocratic Turkey to balance against Russia, China, and Iran more than it needs the Kurds at present.